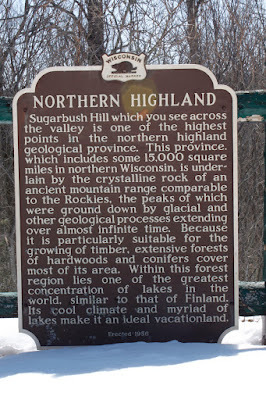 Sugarbush Hill which you see across the valley is one of the highest points in the northern highland geological province. This province, which includes some 15,000 square miles in northern Wisconsin, is underlain by the crystalline rock on an ancient mountain range comparable to the Rockies, the peaks of which were ground down by glacial and other geological processes extending over almost infi­nite time. Because it is particularly suitable for the growing of timber, extensive forests of hardwoods and conifers cover most of its area. Within this forest region lies one of the greatest concentration of lakes in the world, similar to that of Finland. Its cool climate and myriad of lakes make it an ideal vacationland. 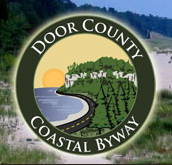 The marker is located at a wayside on eastbound Wisconsin Highway 32 / U.S. Highway 8, just west of its intersection with Kew Da Kik Lane, Crandon, Wisconsin 54520. The marker was pretty much inaccessible because of the snow.